The final stage of our trip through the Balkans is not straight forward, we cross borders three times during the 150km drive from Mostar to the isolated enclave of Croatia that includes our destination, the city of Dubrovnik. This part of Croatia was once the Republic of Ragusa before being conquered by Napoleon Bonaparte and goes some way towards explaining its isolation but, like everything political in the Balkans, the history is very complex. We did not stay in the old town but a short bus ride away at the Lapad peninsula. 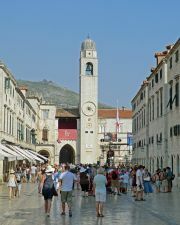 The Old Town, Stari Grad, is by far the most significant attraction of Dubrovinik. We set off after lunch for the short bus ride to the Old Town to take a look for ourselves. The Old Town is not very large, perhaps 10hectares, surrounded by ~2km of city walls. On this tour we have visited several UNESCO World Heritage Sites and Dubrovnik Old Town is another one. That said it is not surprising that the Old Town is an architectural gem and that the damage inflicted during the 1991 siege has been repaired. However, for all its architectural charm and extensive history I was glad to leave the place. Why? (i) Too many people! I was told that Dubrovnik is the busiest cruise ship destination in the World, while this turns out to be an exageration it is in the top 10. The port authority now try to limit the number of passengers allowed to 8,000 each day but admit that sometimes it is up to 10,000. They are pretty much all in the Old Town and I cannot stand crowds. (ii) There is no character in the place, every establishment seems to be geared to separating the tourists from the cruise ships from there money in the short time that they are there. As for the restaurants, bars, cafés… they were all pretty bland, not international chains but infected with the same attitude as the shops. One afternoon in the Old Town was more than enough. It doesn't have to be like this, I really enjoyed our visit to Kotor, another walled town that even had a cruise ship visiting on the day that we were there. I am not the only one who feels this way about Dubrovnik, take a look at Dubrovnik Travel. During the rest of our time in Dubrovnik we spent our time in Lapad, walking, swimming and generally lazing around and enjoying being in one place for a few days. Lapad is pretty much a tourist spot but unlike the Old Town it is not invaded by hordes from the cruise ships. The pace of life is slower and more relaxed. Lynn made the most of these days and swam every day while I wandered aimlessly enjoying the coastal paths with few people and no traffic. Map of the route . For much of the journey we follow the River Tara (Drina) as it wends its way through the spectacular Tara River Gorge, the second longest canyon in the world after the Grand Canyon. At the border crossing between Montenegro and Bosnia-Herzegovina there is no official road. On maps you will see that the road stops short of the border in both countries. Nevertheless, our vehicle crosses the bridge which forms part of the non-existent road. We continue to follow the river for a while and then take highway 18 all the way to Sarajevo, the capital city. We stay at Hotel Lion, a small hotel with small rooms but very conveniently located close to Bašcaršija square, the historic, cultural center of Sarajevo. We arrive early afternoon so spend some time exploring the locality and sampling the local food and drink. On Sunday we take a couple of tours. In the morning we take a walking tour of the Old Town with a local guide. She was a native of Sarajevo and had been a child living in the city during the almost four year period of the Siege of Sarajevo (1992-04-05 to 1996-02-29). The tour covered the entire historical period of the Old Town but every part was also touched in some way by the siege. We visited Jewish, Christian and Muslim places of worship which were all in sight of each other. We saw lingering signs of the siege and also saw the site of an earlier episode for which Sarajevo is famous, the location where the assassination of Archduke Franz Ferdinand of Austria took place in 1914. The tour cost 20KM and was well worth the price. In the afternoon we take another tour, this time we visit some outlying points of interest which are mostly related to the Siege of Sarajevo. Our first point of interest is the Sarajevo Tunnel Museum, located on the south side of the airport. During the siege Sarajevo was completely encircled and supplies were hard to come by. During the second year of the siege a tunnel was built starting at the site of what is now the museum and ran for the best part of a kilometer under the airport. 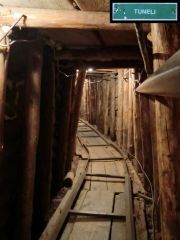 Only a short stretch of the tunnel remains but there is more to the museum than just the tunnel, it is well worth a visit. We move on to Sniper Alley and the Jewish Cemetery on a hillside south of the city. From here we could look down on the city from the vantage point utilised by Serb snipers. The beseiged must have shot back since many of the tombstones in the cemetary were damaged by bullets. Our final port of call on this trip is the Sarajevo Citadel, one of the few high points held by Sarajevo. From this vantage point you can look down on the old town and the cemeteries full of white headstones. The tour cost 30KM, and once again is well worth the price considering that included transport. We spent the late afternoon and evening revisiting some of the sites in the old town that we had seen on the morning tour and then ended the day with a very pleasant meal at Restoran Pod Lipom. Next stop Mostar, we head southwest from Sarajevo along the E73 for about 50km until we reach Konjic and here we cross the Neretva River which we then follow to Mostar. We stayed at the very pleasant and well situated Hotel Kriva cuprija, just a short walk north, on either side of the river, to the old town and the Old Bridge (Stari Most). We cross the river via the nearby Lucki bridge and walk to the beach near the Old Bridge and take the opportunity to cool down with a paddle in the river. We recross the river via the Old Bridge and explore the area north of the bridge. We make time for a beer and a snack and partake in a little "people watching". There are a lot of tourists and plenty of shops aimed at separating them from their money. Like Sarajevo, Mostar was subjected to a siege, this time of 18 months during 1992-1993. During the seige all the bridges were destroyed though they have now all been restored. The Old Bridge (Stari Most) is a UNESCO World Heritage site and was the subject of a careful reconstruction using the original technology and materials. Reconstruction took 3 years and was inaugurated on 23rd July 2004, eleven years after its destruction. That's it for Bosnia and Herzegovina, now we head for Croatia. Once we cross the border from Albania into Montenegro we head for the Adriatic coast and then follow it north along the scenic coast to Budva. We arrive at Hotel Kangaroo late afternoon and immediately set off for the bay and then walk along the coast to the Old Town. The Old Town is Venetian in style and the buildings are in great condition since they were rebuilt after an earthquake in 1979. The Old Town sits on a peninsula, that was once an island, and has great views along the coast in both directions. There are four churches and a couple of museums as well as the shops and restaurants you would expect to find in this major tourist destination. One evening we ate an excellent meal at the tiny restaurant Knez Knoba. On Thursday we take a bus to the nearby medieval walled town of Kotor, another UNESCO World Heritage site. From the bus station it is a short walk to the Old Town which we enter through the South Gate. We meander around for a while before arriving in the northeast of the old town and Church of St Maria which is where the start of the walk up along the old fortress begins. Lynn had sprained her ankle in Ohrid and wisely decided not to make the climb. The serpentine track includes stretches of steps, many of which are worn, leads past the Church of Our Lady of Remedy and eventually to St John's castle (San Giovanni castel). It took me 25 minutes to reach the top and that included stops to explore some of the fortifications and take in the view over Kotor and the bay. From bottom to top it is a vertical climb of ~225m. Once I return to the Old Town I have a couple of hours to kill before I meet up with Lynn, the climb took much less time than I had been led to believe. I walked from the north gate along the north wall which borders the Skurda River and took advantage of the elevated view of the Old Town. I revisited a few areas before settling in to a small bar tucked away near the Church of St Luke. After meeting Lynn we made our way slowly back through Kotor before catching a bus back to Budva. Lynn took the opportunity for one more visit to the sea before spending the evening back in the Old Town for dinner. It is time to leave the coast and we head inland over the mountains and skirt the capital city of Podgorica and turning northwest through the Bjelopavlici plain towards Nikšic. 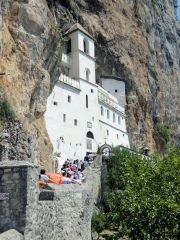 Our destination is the Ostrog monastery. Our accommodation for the night is Hotel Koliba, Bogetici, a longish walk, or short ride to the monastery. The hotel is very pleasant with nice rooms, nice views and good food. We are still in our private minibus so we opt to use it for the trip to the monastery. The bus breaks down and some of us decide to walk rather than wait for it to be fixed. As is turned out we were only about 15 minutes walk away so it had been a good decision. We start at the bottom with the Ostrog Monastery - lower church . We then start the climb to the upper church but after only a short distance we find another church, name unknown. You could walk a long gently inclined route along the road to the upper church, alternatively you can follow the much steeper, but shorter path. Lynn's ankle was still unreliable so she continued to explore the lower church while I took the path to the top. It was a hot day but much on the path in th shade of trees so not too much of a problem. The complex at the upper church is quite extensive and there was a long, slow moving queue of people waiting to enter the Ostrog Monastery. I have queuing and gave the opportunity to see inside a miss though I did look inside some of the other features. There were a lot of pilgrims visiting and a lot of them were camped out waiting for a miracle. After a while I realised that our guide was here and that she had arranged a replacement bus and everyone was now at the upper church. A few of us, including Lynn, arranged to meet back at the lower church before walking back down the path. I must have been intent on climbing up and didn't notice fellow walkers but on the way down I noticed a lot of what must have been pilgrims climbing barefoot. That's it for Montenegro, now we head for Bosnia and Herzegovina. For our journey from Ohrid to Tirana we take a private minibus. It is another lovely day and as the temperature rises the weaknesses of the air-conditioning become evident and some our Aussie travel companions "become uncomfortable". Personally, I do not like a/c and would prefer windows that can be opened. We head north around Lake Ohrid and after we cross the border into Albania we turn away from the lake and head west through the mountains towards Tirana, the trendy capital and largest city of Albania. 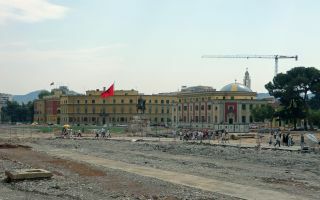 Tirana is a relatively new city by European standards being founded in 1614 by Sulejman Bargjini and only became Albania's capital city in 1920. There is still a lot of the grey, dismal, communist era city, but there is also a lot of new, more colourful development. One example while we were there was the extensive improvements taking place in Skanderbeg Square. Like most of the places that we visit on this tour our time is short. We spend the bulk of our time exploring the central area starting at Bulevardi Zogu I which takes in the National Historical Museum at the north end heading south on to Skanderbeg Square and numerous public buildings followed by Bulevardi Deshmoret E Kombit which is bordered on both sides by green space and takes in Rinia Park and the now rather delapidated Pyramid of Enver Hoxha. 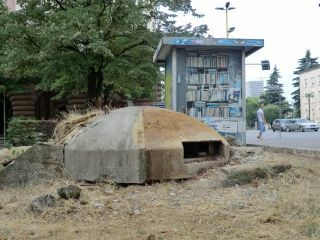 Even here in the heart of the city and the seat of government you can still see remnants of the past, just off the main Boulevard, beside a bus stop, is one of the 700,000 bunkers built during the Communist era. We decide that we've seen enough of the centre and take a taxi back to our hotel. We are staying a couple of kilometers northwest at Hotel Ferari, probably the best hotel on this tour with nice rooms and a pool. The local area provides a contrast from the grandeur of the city centre and we explore the small shops and cafes. Later in the evening we return to a small restaurant and enjoy a nice meal. The proprietor spoke English and tried to talk me out of the Albanian dishes on the basis that "foreigners do not like Albanian food", but I insisted and he was pleased to hear that I enjoyed it. A slight rephasing of the famous saying: When in Albania, eat Albanian food and drink Albanian beer! We have one more stop in Albania and that is at Krujë, a small town about 20km north of Tirana in the mountains. We spent most of our time in Tirana at two museums, the Skanderbeg Museum and the National Ethnographic Museum. 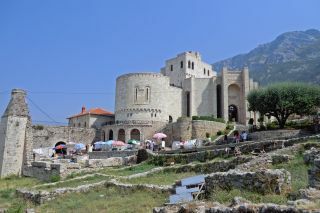 The Skanderbeg Museum is housed in Krujë Castle which is built on a hillside in the south of the town. The Museum honours George Kastrioti Skanderbeg, whose namesake square we visted in Tirana, a national hero of Albania. It is quite a small museum but is quite interesting and well worth the 200ALL entrance fee when we visited. The Ethnographic Museum is just a short walk from the Skanderbeg Museum and is housed in an old merchant house and consists of perhaps a dozen rooms depicting life in the 18th century. There are english speaking guides to describe the rooms and their usage. Strangely you pay when you leave, assuming that you aren't the sort of person to save a few lek and sneak out the way you came in. We both found the museum interesting. Cultural activities done it is time to find somewhere for lunch. There are lots of shops aimed at the tourists in the Old Bazaar which we walked through trying to find an interesting place to eat. We didn't find anywhere very interesting but did manage to get a reasonable pizza. That's it for Albania, all we have to do now is head north for Montenegro, still in our private minibus. We were too late arriving in Sofia to attend the "trip briefing" but our guide has left us some information on our departure time and meets us for breakfast. We are booked on the public bus to Skopje, Macedonia's capital, departing at 08:00 from the Central Bus Station. The public bus is comfortable and we have reserved seating. We travel through attractive, mountainous scenery with a stop along the way. We arrive by lunch time so all afternoon to explore. It is a short walk to the Stone Bridge across the River Vardar. 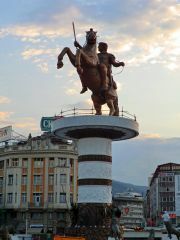 Along the way we pass a lot of modern statues in the streets and in Macedonia Square is a huge, 12m bronze statue A warrior on a horse with a rider on a horse rampant. The statue has only been erected in the last couple of weeks and is still not complete. The official name of the statue not withstanding, everybody knows that it is really Alexander the Great, much to the annoyance of Greece! Time to grab a snack and a beer. Before crossing the river we walked up the pedestrian street that leads to the Old Railway Station, Museum of Skopje. The clock on the wall of the old station stopped at 5:17 when an earthquake struck on 26 July 1963. There is lots of statuary along the street including a couple of statues of Mother Teresa near the Mother Teresa Memorial House. We then cross the river via the Stone Bridge and explore the area around the Kale Fortress followed by the small streets that make up the city's Old Bazaar . As the sun is setting we find a quiet spot among the many small establishments in the bazaar where we can take our evening repast. It is another early morning. We have now done Skopje and we take another bus to our next stop, Ohrid on the western shore of its namesake, Lake Ohrid. 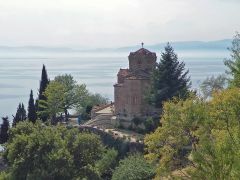 Ohrid is one of the few Cultural and Natural UNESCO World Heritage Sites, and it is not hard to see why. It is a lovely area with the town set on the mountainous shore of the lake. 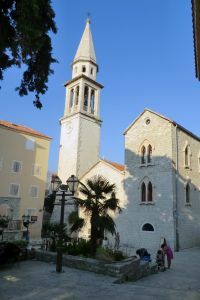 We take a walking tour of this small city and end up at the Church of St John the Theologian at Kaneo before returning along the lake front. The weather was delightful and we enjoy an al fresco meal at a waterfront restaurant. A pleasant, relaxing place where we could happily have spent another couple of days. The journey from Budapest to Sofia should have been simple. 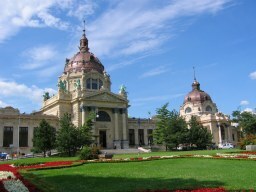 A train to Beograd, a 40minute stopover then depart Beograd in a sleeper compartment for the overnight journey to Sofia. All starts well, we take the metro to Keleti pályaudvar, a rather rundown station that demonstrates that not all of Budapest has yet been modernised. We find our seats on the EC 345 train that leaves on time for a scheduled 7½hour journey to Beograd. The journey south was through a largely flat agricultural area which was pleasant if unremarkable. We arrive at the Hungary-Serbia border a little later than scheduled and then just sat there, no apparent activity, so presumably all bureaucracy for the train operator. We then move a short distance across the border into Serbia and have a long wait while immigration officials "do their thing". Eventually we get going again but we are now more than 2 hours behind schedule. During this time we were sitting and chatting with a Serbian student on her way home to Novi Sad. She tells us lots about Serbia and Novi Sad in particular which suggests that it might have been a good place to stop if we'd scheduled more time. She also said that the time we spent at the border was not unusual. After a slow journey in which we progressively lose time during each leg we finally arrive in Beograd at 23:05CEST, i.e. 2½hours late, and, no surprise, we've missed our connection, the D 293 is long gone. 10 hours after leaving Budapest we have covered ~200miles. The late arrival is not a surprise to Serbian Railways and to be fair they are ready for a lot of passengers who have missed their connection. They rebook us on to a train the following morning and provide us with accommodation at a nearby hostel reached by walking west long the railway tracks. The hostel is not very salubrious but I've slept in worse. Since we hadn't planned on stopping in Serbia we had no local currency (Serbian Dinar) though it wouldn't have helped much as nowhere was open at midnight. We get a reasonable nights sleep and get up early to be sure that we catch the 7:30 train, the D 491. I manage to change a few Euros for Dinars and we grab some breakfast at the station. We have no reserved seats on this train and get on early to ensure that we get some. The train is crowded and many are standing in the corridors as we depart on time. The train is of the old communist-era variety with only two carriages consisting of compartments for six. Compartments had windows that could be opened which was great later when the temperatures got up to around 40°C. In our compartment there are two Bulgarians in the window seats and a Serbian lady with two children who kindly squeezes into two seats to make room for the two of us. The train is very slow as we head south from Beograd, it meanders its way to Mladenovac and then we go a little quicker. As we head south the terrain is very like that we encountered travelling from Budapest to Beograd but as we get closer to Niš we start to move into more mountainous terrain. We arrive in Nis roughly on time and take on a lot of passengers. The Serbian lady and her children leave and we are joined by a Dutchman and a Serbian. Now there are lots of people standing in the corridors. The Serbian proved to be friendly and talkative. He talks about Niš, his home, which sounds like another place worth visiting. He also shares some interesting information about the railway system. We observe that the train is very full and he explains that is because they only schedule as many carriages as there are passengers. The explanation is corruption, the train is always packed to overflowing because people do not buy tickets, locals instead slip the conductor some cash when asked to present their ticket. In practice there are more than double the number of people travelling on the train than have tickets. The track we are using used to be part of the route followed by the Orient Express but has fallen into disrepair, hence the slow speed. Investment is on hold hoping that the EU will one day pay for the improvements. Railway workers are not the only ones who are corrupt, border guards are also on the take. He tells us about smuggling cigarettes between Serbia and Bulgaria, these days it is from Serbia to Bulgaria, in the past it was the other way. There is small scale smuggling with individuals carrying 5-10 packets and larger scale moving 10 times that. Little did we know that we would get to see such smuggling in action. Just before the border a lot more people joined the train, seemingly the smugglers. A couple of old ladies squeezed themselves into our carriage and stowed all their belongings. We watched a guy constantly moving along the corridor in a real sweat. Our Serbian fellow passenger said that he was one of the larger scale smugglers secreting his goods in the train. When we got to the border it was just our luck that the officials were a little more thorough than usual and searched the train. One of the ladies was caught with a couple of packets in her socks and was carted off. The other lady in our compartment was used to the procedure and just raised her clothes so that her bare middle and bra were exposed to demonstrate that she wasn't hiding anything. We finally got moving again after about two hours at the border, it had been very hot what with the outside temperature combined with the crush of people and we were thankful for the old fashioned windows that we could open. As soon as we left the Bulgarian border post the smugglers started retrieving their contraband and immediately started selling it on the train. The old lady who had exposed herself turned out to be smuggling and had carefully secreted about 10 packs under my seat. We eventually arrived at Sofia at around 19:30CEST, a couple of hours late. A 12 hour journey to cover ~250 miles. Slow but it turned out to be anything but boring! From the station it was a simple 20 minute walk to Scottys Boutique Hotel. We found somewhere to eat and I enjoyed my first Shopska salad which we shared along with a very good pizza and some beer! During our visit in Budapest we stayed at the Carat Boutique Hotel, this turned out to be a good choice, a nice hotel, conveniently situated in Pest half of Budapest, a short walk from Deák Ferenc square. Lynn always likes to plan her trips and on the agenda were pretty much all of the major highlights in our guidebook (Budapest, AA CityPack). The weather was superb so we will make the most of it spending our time outdoors. To get an overview of the city we took a walking tour with Budapest Tours, this was a half day tour and only covered Pest (there was another tour for Buda). The walk started near the tourist office at Deák Ferenc Metro and ended at the Great Market Hall but we continued on to Ráday utca, a street with lots of nice restaurants, for lunch. Although I have visited Budapest a couple times before I found the couple of hours for the trip to be both informative and useful. Over the few days of our trip we revisited some of the places we had briefly visited on the walking tour. The Terror House Museum is related to two recent periods in Hungarian history, the fascist and communist regimes. During the Second World War the building was the headquarters of national socialist Arrow Cross Party. 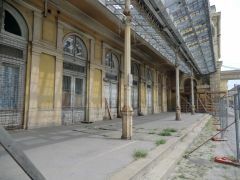 After the war it was occupied by Hungary's State Security Agency (AVO). It's name is well deserved. It was well worth the hours we spent there, fascinating! There was one other activity high of Lynn's list, a visit to a spa. There are lots to choose from but the list is reduced when the constraint that it must be a traditional outdoor one is applied, we settled on Széchenyi Gyógyfürdo Uszodája in City Park. While Lynn luxuriated at the spa I spent the time exploring City Park taking in Vajdahunyad Castle and a quiet bar. Also on the list was Nagy Zsinagoga, The Great Synagogue (the largest Synagogue in Europe). The only item of interest to me was The Memorial of the Hungarian Jewish Martyrs in the rear courtyard. Lynn found much more to fascinate her so once again I sought out a nearby cafe to chill out and do a little people watching. We managed to find some really good food, not too difficult a task, at reasonable prices. On some occasions a single portion was enough for both of us. We will have to visit again one day, I'm sure Lynn would enjoy exploring Buda. Budapest has changed a lot since my first visit in February 1997, in many ways the changes are for the better, but I'm afraid that it is losing some of its original unique charms and becoming a typical northern European city. The last time I was in Buda I felt that it had retained more of its charm than Pest, that is why I'll have to bring Lynn back -- to see Buda. After ringing a Quarter Peal of Plain Bob Minor I set myself some goals, the most challenging of which was to master something on 8 bells. While I cannot claim to have achieved mastery, I have satisfied myself with ringing a Quarter Peal (recorded on Campanophile) of Grandsire Triples in a time of 44 minutes. It takes eight people to ring Grandsire Triples and I could not have done it without the kind assistance of seven people willing to give up their time on a Friday evening to help me ring this for the first time. Once again I have to decide what I want to tackle next. I will continue with Stedman, both Doubles and Triples, but I'll have to think a while about what new to tackle.